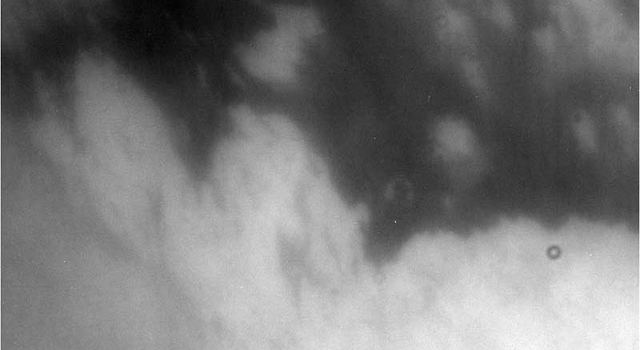 Long hidden behind a thick veil of haze, Titan, the only known moon with an atmosphere, is ready for its close-up on Oct. 26, 2004. This visit by the Cassini spacecraft may settle intense speculation about whether this moon of Saturn harbors oceans of liquid methane and ethane beneath its coat of clouds. Cassini will fly by Titan at a distance of 1,200 kilometers (745 miles), with closest approach at 9:44 a.m. Pacific Time. This flyby will be nearly 300 times closer than the first Cassini flyby of Titan, on July 3. This is one of 45 planned flybys of Titan during the four-year tour. Subsequent flybys will bring the spacecraft even closer. Scientists believe Titan's atmosphere is similar to that of early Earth. "Cassini will see Titan as it has never been seen before. 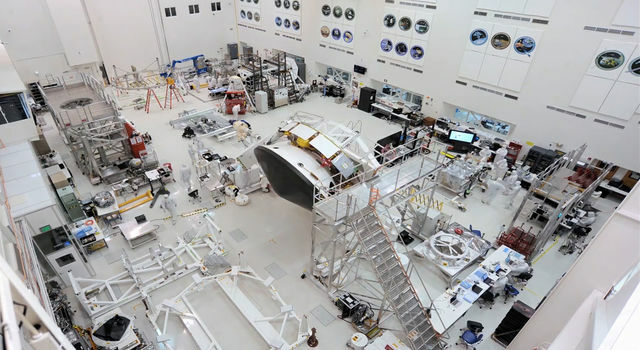 We expect the onboard instruments will pierce the moon's dense atmosphere and reveal a whole new world," said Dr. Charles Elachi, director of NASA's Jet Propulsion Laboratory, Pasadena, Calif., and team leader for the Cassini radar instrument. One important goal of this flyby is to confirm scientists' model of Titan's atmosphere to prepare for the Huygens probe descent. The probe, built and managed by the European Space Agency, will be cut loose from its mother ship on Christmas Eve and will coast through the atmosphere of Titan. On the way down, the probe will sample the atmosphere with a sophisticated set of scientific instruments. "Titan has been lying still, waiting. Cassini may finally show us if what we thought of this moon is true, and whether the Huygens probe touchdown will be a splash," said Dr. Jean-Pierre Lebreton, Huygens project manager and project scientist for the European Space Research and Technology Center, Noordwijk, Netherlands. Eleven of Cassini's 12 instruments will be aimed at Titan during this encounter. Scientists hope to learn more about Titan's interior structure, surface, atmosphere and interaction with Saturn's magnetosphere. This first in-place sampling of Titan's atmosphere will help in understanding the atmosphere's density and composition, which, in turn, will help aid management of the Huygens probe. 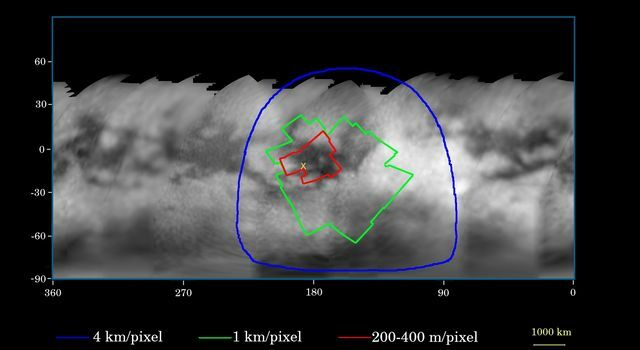 This flyby will mark the first time Cassini's imaging radar is used to observe Titan, and is expected to provide topographical maps and show whether there is a liquid or solid surface. 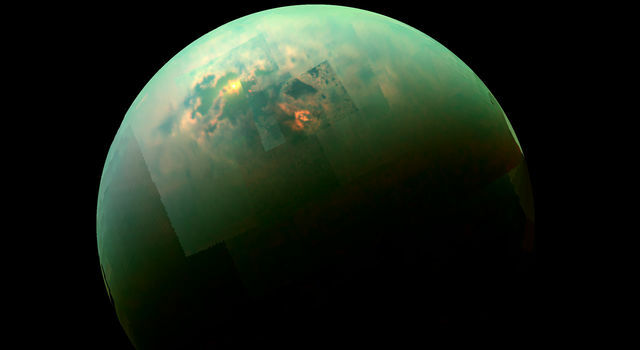 "We know our instrument will see through the haze to Titan's surface," said Dr. Robert H. Brown, team leader for the visual and infrared mapping spectrometer, University of Arizona, Tucson. 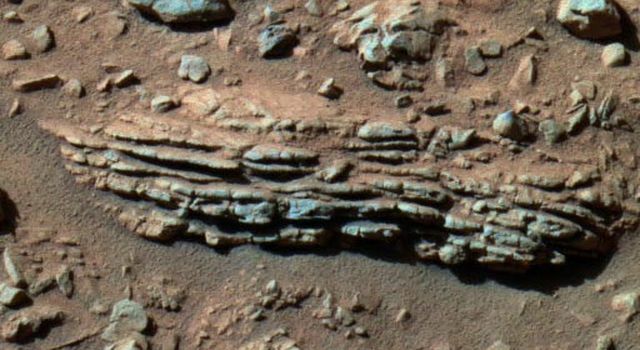 "This encounter is about digging down below the atmosphere and getting our first glimpse of Titan geology." Cassini's ion and neutral mass spectrometer will taste mysterious, subtle flavors in Titan's atmosphere. 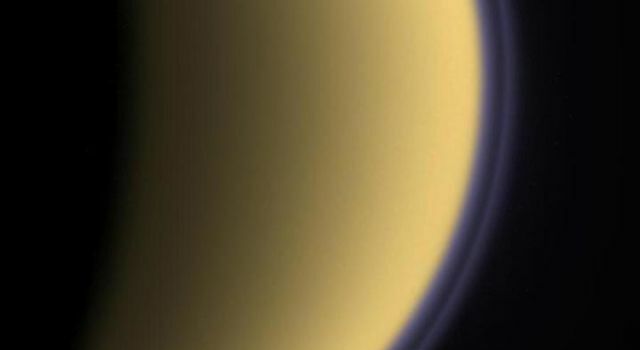 "Our instrument will scoop up a breath of Titan's puffy atmosphere during the flyby," said Roger Yelle, instrument team member, also with the University of Arizona. The experiment will measure how many molecules of different masses it gathers in the gulp of Titan's mostly nitrogen, methane-laced atmosphere. Titan is Saturn's largest moon. It is larger than Mercury or Pluto and is the second largest moon in the solar system, after Jupiter's moon Ganymede. Titan is a cold place thought to be inhospitable to life at 95 degrees Kelvin (minus 289 degrees Fahrenheit). Cassini has performed flawlessly since entering orbit around Saturn on June 30. The team believes that on Tuesday night, all will proceed as planned. "This is not the same white-knuckle situation we had during Saturn orbit insertion, but there are some things we can't control," said Earl Maize, deputy project manager for the Cassini-Huygens mission at JPL. "If a spacecraft anomaly should occur, or if the weather at the tracking stations does not cooperate, the science return may be limited or lost. Although this is an unlikely scenario, the possibility still exists." Cassini will have only one opportunity to send the data back to Earth before the data are overwritten on the recorders by data from the next set of observations. The first downlink of data by NASA's Deep Space Network occurs at 6:30 p.m. PDT.